Oceans are the lifeblood of the earth and of humankind. The marine environments have historically been a source of awe, food, transport and recreation for humankind. However through our fishing efficiency, our blasé attitudes regarding the ocean as our dumping grounds, and humankind’s unfortunate ideology that the environment was created for our use and disposal, we are polluting and over-fishing our oceans almost to the point of no return. Ocean covers 71% of the earth’s surface and contains within its realms approximately 100 million species. The oceans produce 70% of the earth’s oxygen, and have provided generations of humans with food and recreation. Yet, in less than one hundred years, since the widespread use of plastic began, the degradation of our marine ecosystems as a result of plastic pollutants has been immense. In 2014 an estimated 268,940 tonnes of plastic was adrift in our oceans, while it is estimated that a further eight million tonnes of plastic waste is entering oceans annually (World Economic Forum 2016). There are many ways plastic waste can enter the ocean ecosystem. Littering and irresponsible disposal of rubbish and fishing gear is the most obvious, however rubbish that has been taken to the dump also makes it to the ocean. Dumping grounds are often overfilled, and with excessive rainfall or strong winds, plastic rubbish is runoff or blown into waterways and subsequently the ocean. Furthermore, plastic contains numerous watersoluble compounds, some of which are highly toxic, and these are absorbed by rainwater. The rainwater and plastic-compound combination is known as leachate. Leachate can infiltrate ground water and thus eventually may make its way into water-based ecosystems, poisoning the environments and harming wildlife. On a global scale 80% of all marine pollution originates from land based activities, and most of this waste comes from within 50 kilometres of the shoreline. Upon reaching the ocean, plastic can immediately affect the environment and wildlife in many ways. 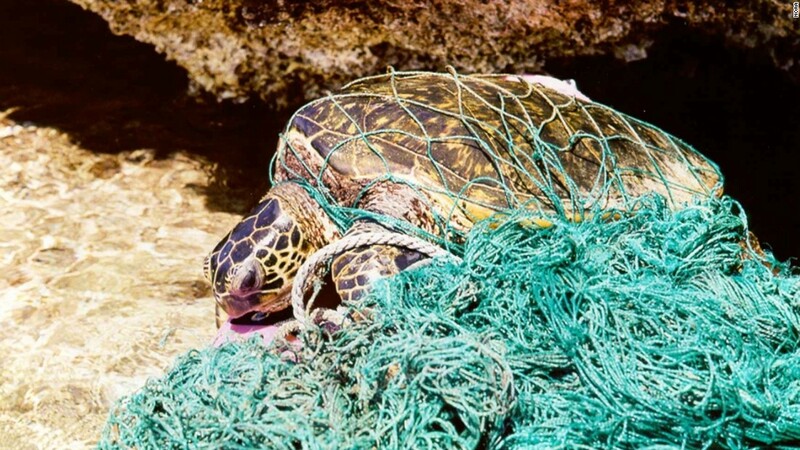 Larger plastic materials, known as macro-plastics such as plastic bags, six-pack rings, straws and ghost nets are among the main culprits for killing marine animals either by entanglement, suffocation, choking or internal blockages. Marine animals often mistake these plastic materials as food, and upon entering the mouth plastic materials can choke or suffocate. If the plastic manages to pass into the digestive system, internal blockages and intestinal perforations may occur. According to the Marine Pollution Bulletin (2017) in 2014, 56% of dolphins, whales and porpoises had swallowed at least one piece of plastic. These large marine mammals are not the only victims of plastic pollution, but so are seals, sea lions, puffins, albatross, penguins, turtles, cetaceans and fish. In fact, according to a study conducted by Plymouth University, a minimum of 700 marine species are at risk from negative effects as a result of plastic. However, it is not the visible-sized pieces of plastic that are causing all the damage, microscopic plastic particles are causing chaos in other ways – there is an estimated 5.25 trillion plastic pieces in our oceans. As plastic was invented with longevity in mind, plastic takes an incredibly long time to break down – up to 1,000 years – and these pieces are microscopic polymers and toxic chemical compounds. Plastic does not ever fully biodegrade. As a result of sunlight and wave friction, some plastic can break down into small pieces of five millimetres or less in diameter, known as microbeads or micro-plastics. Toxic chemicals from industrial or agricultural waste are absorbed or attached to these tiny pieces of plastic, resulting in the microscopic plastics transporting toxic chemical compounds around the ocean. These microbeads are often mistaken as plankton and eaten by larger animals, or can be ingested inadvertently, for example when a baleen whale or an oyster filters for food. Shockingly, according to National Geographic, in some parts of the ocean there are 60 times the amount of plastic particles than plankton. According to Ocean Crusaders, at least two thirds of all fish are suffering from plastic ingestion. Of course, beyond the poisoning and degradation of marine ecosystems, plastic pollution affects the perceived quality of the environment. Often plastic is washed back ashore to pollute beaches, estuaries and other coastal habitats. According to National Geographic, 100,000 marine species die annually as a result of plastic related problems. A further one million sea birds die annually from plastic ingestion. The aforementioned choking, entanglement and suffocation is a shorterterm issue, however, thousands of animals are dying slow and painful deaths as a result of plastic. If larger plastic pieces make it into an animal’s digestive system it can sit in the stomach indefinitely causing an animal which feels full to die of starvation. If the plastic is passed further along the digestive tract it can often perforate or rupture the intestines. “If a turtle swallows plastic it can get caught in the intestines, it can block food, it can cause the turtle to starve to death”. High concentrations of plastic have been found blocking breathing passages or stomachs of many marine species. As just one example, “when researchers examined the stomach of a beached sperm whale in 2012 they found thirty square metres of tarpaulin, a 4.5 metre long hose, a nine metre long plastic rope and two flower pots” (National Geographic). Debris induced mortality rates for crustaceans were recorded at up to 22% by the Marine Pollution Bulletin’s 2017 publication. While 90% of all sea birds have been known to have ingested plastic debris. 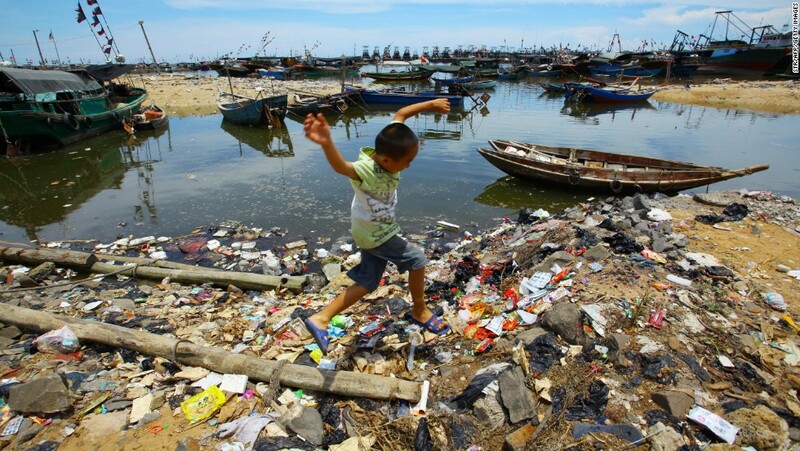 Marine pollution not only poisons marine animals, but can, in the long term, poison humans. The aforementioned microbeads absorbed with toxic chemicals are initially mistaken for plankton by small fish, and as that fish is consumed the chemicals begin to preceed up the food chain and may eventually be consumed by humans. Every time the chemical is passed on from one trophic level to the next, the chemical concentrates, potentially leading to Bisphenol-A (BPA), Polychlorinated biphenyl (PCB), DEHP, mercury or lead poisoning in humans. Furthermore, as currents transport plastic around the ocean they are swept into gyres, which are large-scale, circular current systems. There are five predominant gyres worldwide, located in the North and South Pacific, North and South Atlantic and the Indian Ocean. The most infamous of these gyres is the largest, located in the North Pacific, also known as the Great Pacific Garbage Patch. The Great Pacific Garbage Patch contains approximately seven million tonnes of rubbish, is 2.7 metres deep and is the size of Europe. As a result of plastic pollution, and typically in areas close to densely populated land areas or near gyres, there are ocean dead zones or hypoxic areas, which are unable to sustain healthy life forms. UNESCO has stated that there are approximately 500 dead zones globally, contributing to an area in excess of 245,000 square kilometres. Increased ocean acidification and ocean dead zones could be, at least in part, as a result of plastic pollution. Education surrounding plastic pollution is becoming more widespread, with experts and scientists conducting TED talks, with newspapers and alternative news websites publishing articles about the woes of plastic, with quirky yet factual animations about plastic pollution popping up on YouTube and school children getting involved in environmental education with a strong focus on plastic. The negative impacts of plastic products are becoming an issue at the forefront of many people’s minds. With recent increases in environmental awareness and pollution issues, many people are making conscious decisions to use less single use plastics and get involved with and buy products from more environmentally conscious companies. Younger generations tend to take littering, pollution and environmental protection more seriously. Melati and Isabel Wijsen, two teenage girls from Indonesia have created an international campaign to ban plastic bags in Bali. Students from Hawai’i are taught in school through field trips about their ocean environment and the impacts plastic has on their native creatures. And at just 19 years old, Boyan Slat, a young Dutch man, founded the Ocean Cleanup which develops advanced technologies to remove plastic from the oceans. With increased environmental awareness, and particularly with the help of technologies like the internet, many people are educating themselves about the plight of the ocean. With the encouragement from young people, like those mentioned above, and from campaign groups dedicated to ocean health, our knowledge of the ocean and its problems is greater than ever before. I could talk on this topic forever, but I encourage you all to do some of your own research. The marine environment is critical for the health of our planet and the health of humankind. Humans rely on the oceans for many reasons, but our complacency regarding pollution of the oceans is causing great harm. Plastic, a commonly used global resource, is invading our oceans and polluting our ecosystems. While environmental education and awareness is increasing, there are little legislative measures being taken around the world to minimise the use of this resource and ensure the correct disposal of plastic. As Ryunosuke Satoro stated “Individually we are one drop, together we are an ocean,” so let us work together, as a nation and as one world to stop the plastic pollution of our oceans.